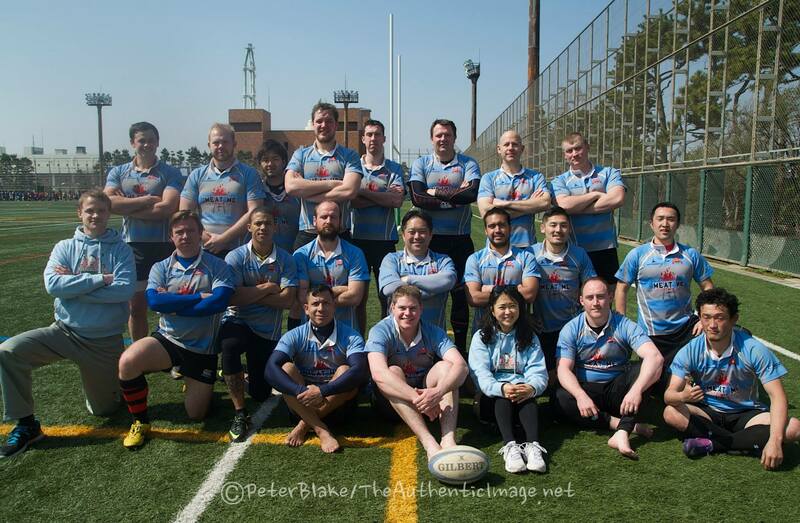 There were many dry throats and sore heads at the sparrow’s-fart on Sunday morning when we assembled in some random train station in the Tokyo ‘burbs for the second match of our big weekend’s double-header. Some lads managed to get home and rest, while others took the less orthodox approach of sleeping in a Roppongi Karaoke bar. Regardless, we managed to get a good turnout of players and even had some to lend to the other team. The Cru were extra motivated to have a good game for Taku, who may or may not play again for us before heading to Okinawa. He has been a great asset for us in the mid-field, and it’s been appreciated by me especially, as I can play with a regular #12 each game. The pre-match talk was little different to the previous night’s: we’ll score plenty of tries, don’t worry about that – let’s just make sure they don’t score any. We were disappointed to let our guard down against All France and let them get a try, so we were determined that it wouldn’t happen again. It was a great Spring day for rugby and so the ref was keen for an 80-minute game, but thankfully both teams managed to talk him out of it. From the opening kick-off the forwards worked hard at securing our own ball at the breakdown and the backs finished off plays strongly. With our fearless Captain back in action (barely), Luis was put on the wing and showed his versatility, finishing off two great team tries on the wing to get the Cru out to an early lead. This was followed by another good team try, finished off by Ricky, who chalked up his first of what we hope will be many for the Cru. Taku also managed to score in the first half. So, at the half, the score was 26-0, despite the relentless attack from the opposition and their rapid defensive line, and the fact that we had the breeze in our faces. So we were faced with the challenge of keeping the attack at bay and maintaining the clean slate that we failed to do against All France. With the breeze at our backs, the Donkeys barely spent any time in our 22 as Evan and Travis managed to win the territory battle with well-placed kicks behind the defensive line. This was a key in our defensive plan. And naturally, the attack looked after itself as Ricky continued to run kicks back from fullback and Luke made storming runs in mid-field, showing Skurry what Evan wanted him to do when he was screaming earlier in the first half. Taku ran effective angles in mid-field and managed two more tries in the second half, making it a hat-trick for the game. This may turn out to be a nice leaving present for Taku. The score ended up being 47-0. Well done lads for keeping the defence strong and playing until the final whistle. It was a highly successful weekend and another big step for the club. We are improving in the basics of the game, such as retaining our own ball at the breakdown, running in groups and making good passes. We are giving away too many penalties, though, at defensive rucks, so we need to either learn the rules of the ruck or just stay in the defensive line and leave the ball alone. Special thanks for Naoki who played flanker in the first half and helped out the opposition. Thanks also to Nestor who also played a half for the donkeys. Congratulations and welcome to Rei Morimitsu who played his first game for the Cru. He made a couple of brilliant, textbook tackles in the second half and we hope to see more of him in future games. Thanks to Yorkie, Stu and Wyn who made the trip even though they didn’t play. Thanks also to the Navy lads who came a long way to play, as they do most weeks. In the absence of a nearby Izakaya, the team stayed at the ground and made the most of the sun by drinking beers and watching the matches that followed, including the Champions’ Cup Final. Congrats to Tooley who managed to break his post-retirement try-less streak, picking up a try in the Shuto League Committee team game.